Since its opening in 1950, some of the most famous names in motor racing have left their tyre tracks around Castle Combe’s challenging tarmac… and now it’s your turn! Taking place across Friday 20th and Saturday 21st July, Classic Bike Trackdays is offering a rare opportunity to ride the West Country’s famous circuit, and experience the 1.85 miles of fast sweeping bends, chicanes and the infamous Avon Rise and Quarry Corner. 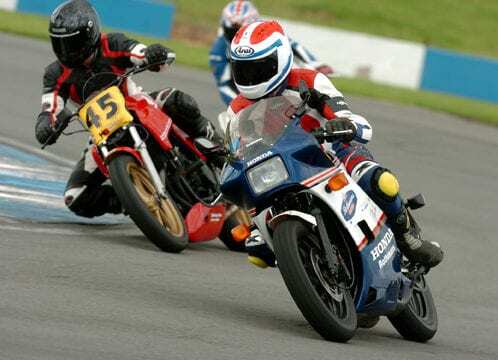 For the uninitiated, Classic Bike Trackdays are open to all pre-1995 bikes (although later bikes may be allowed, if they’re in the spirit of the event). Riders with all levels of experience are welcome, with the groups split into similar aged machines, by capacity and by rider experience. Plus, there’s free professional ACU instruction provided throughout the day, tyre services from Continental Motorcycle Tyres, Trackside photography from Xtreme Photography – and friendly advice and assistance from the whole Classic Bike Trackdays team. Format for the day, an explanation of groups, session times, lunch, sighting / warm-up laps etc. On track safety including, overtaking, courteous riding, what (and what not) to do in the event of an accident, etc. Each initial session starts with warm up laps behind an instructor in the first session for each group. The sessions will be divided either by the age of bike so there are always comparably machines on track, by engine capacity, or by rider experience – which will depend on the bookings for each event. The sessions will rotate every 15 or 20 minutes depending on the venue.